The importance of physical security for protecting data is generally well understood, but how often does your organization assess the level of physical security for protecting data? And, are you compliant with regulations that address this? All data privacy standards and regulations require physical access control measures for data processing and storage equipment, but with most regulations, it is up to organizations to decide which specific method or technology to use. Because of senstive data privacy concerns, certain segments of our industry—particularly health care and financials—look at cabinet access control more strictly, requiring a detailed report of who, when and why the cabinet is accessed. 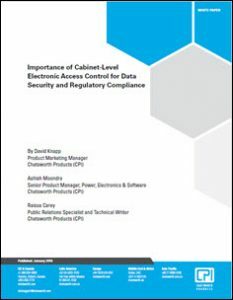 This white paper, by Chatsworth Products (CPI), presents an overview of data security regulations and compliance requirements, makes an argument for extending physical security to the rack level, and recommends the use of electronic locking and access control systems at the rack level.